The European Commission has reportedly dropped its proposals to close depleted cod grounds in the North Sea, Irish Sea and the west of Scotland. The decision was made after opposition from the UK and other EU member states with a North Sea coastline. The closures were put forward by the Commission two weeks ago as a means to help conserve stocks. 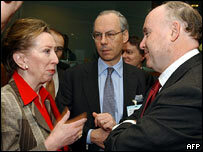 Talks on national fishing quotas have started in Brussels between government ministers and the commission. UK fisheries minister Ben Bradshaw told the BBC of the decision to abandon the closures on Tuesday. 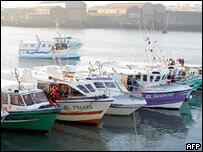 French fishing boats have been blocking some northern ports in protest at the Commission's proposed quotas. Conservationists are also demonstrating at the annual haggling marathon because they say the cuts do not go far enough. At stake is the future not only of the dwindling stocks of cod and other pressure species but also the livelihoods of traditional fishing communities around the UK and across Europe. On 16 December, Mr Bradshaw told the BBC News website that he would oppose the EC plans at the meeting. Mr Bradshaw said the UK had already made some tough decisions and that this was not the year to introduce closed areas. He said other EU nations would support the UK to block the EC proposals. EC fisheries commissioner Joe Borg says that some countries - principally the UK - have made great conservation efforts, but better enforcement of fishing restrictions is needed. The European Commission is asking fishing fleets to absorb reductions in their catch of up to 60% for herring, 34% for cod - although there will be no change in the cod quota for UK waters - and 27% for mackerel. A report in October by the International Council for the Exploration of the Sea (Ices) went further than the European Commission's proposals. The scientific advisory body called for a ban on cod fishing in the North Sea, the Irish Sea and west of Scotland in 2005. The Commission said that, after studying scientific reports on the state of fish stocks, its proposals for 2005 balanced the urgent need for reinforced conservation measures with the equally urgent need to keep the industry in business. Ahead of the talks - which could last three days - the National Federation of Fishermen's Organisations (NFFO), a group that represents mainly English and Welsh trawlermen, backed the UK government stance. It believes the existing UK steps taken to conserve cod stocks should be recognised by the Commission and other EU fisheries ministers. NFFO president Arnold Locker said: "Over the last three years we have seen our cod quotas slashed by 80%, our mesh sizes increased by 20%, half our boats scrapped and our time at sea cut to 15 days a month. "Partly as a result of these measures, the biomass of cod, according to the scientists, has increased in two successive years. "No one is suggesting that we are out of the woods on cod yet, but this is not the time for a further suite of new measures. "This should be a period of consolidation to allow those measures already in place to work. Cod stocks are slowly rebuilding."